In three years of homeschooling I've learned that with a deck of cards and a handful of dice you can teach most anything! 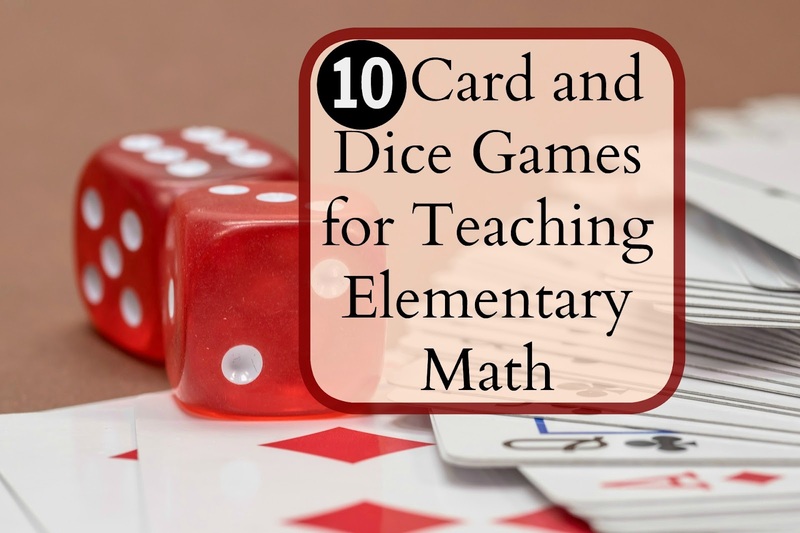 We just love putting away our books and using card games and dice for a fun math lesson. 1. War-- we've played regular war games when the kids were young enough to need to know greater than/ less than. We've played war games where we flip over two cards (after removing face cards) and adding them or multiplying them. We've used a few decks put together and flipped over three or more cards building the largest 3 or 4 digit number we could and then warring. We've flipped two cards over putting the smaller number on top of the larger number and making fractions to compare. 2. Flip 10-- Using just the number cards (or an Uno deck) we play Flip 10. It's just like memory but with a fun math twist. We turn over two cards; see if they add to 10. If they do we get to keep the cards and go again but if they do not make 10 they get turned back over and it's the next person's turn. 3. Zap It!-- For Zap it! the players take turns rolling two die; they either add or multiply them. If the player gets the answer right they get to take a counter (bead, chip, grain of rice, etc) and it's the next player's turn. If doubles are rolled they've been Zapped and all counters go back to the middle. The one with the most counters at the end of the game wins. We usually just set a timer to keep it fair and when the timer goes off the game is done. Most of the time we play several rounds! 4. Double Down-- This is a great game for learning near doubles (you could adapt this to subtraction or multiplication too). Players take turns rolling two dice. They only add them up and total the score if they roll NEAR doubles; 3+4, 5+6, etc. Call out Double down and figure out the sum of the dice. The sum of all the near doubles rolled for each player is their score. The player with the highest total at the end of the game wins. 5. 5 Cards Make 10-- Each child receives 5 cards and tries to find all the ways they can make 10 using any combination of cards or operations. The one who can find the most ways to make 10 wins that round. We found this game in the Games for Math book by Peggy Kane and just loved it; it was challenging but fun. 6. 500 Shakedown-- Each player starts with 500 points and then take turns rolling a pair of dice. Each player makes a two digit number and subtracts that from their points. The object is to be the first player to get rid of all 500 points. We found this game in Games for Learning by Peggy Kayne (her books are awesome!). 7. RMM-- Range, Median, Mode. Deal 5 (or 7) cards to each player. Have them figure out the range, median and mode for each hand. They score 1 point for having the highest range, highest median, and highest mode for a total possible score of 3 points per round. Play until one player reaches 25. 8. Boxed Numbers-- For adding three digit numbers (though you can easily modify it for more or less). Each player starts with a blank sheet of paper and draws 6 boxes; 3 on top and 3 right underneath them. Take turns flipping over number cards and filling in your sheet to make two three digit numbers then add them up. The one with the largest sums wins. 9. Target Multiplication-- Using three sheets of paper you draw some targets and assign a multiplication fact family to each sheet (x3, x5, and x10-- or whichever facts you are working on). Set the targets on the floor and take turns flipping number cards onto the targets. Whichever target your card lands on you multiply them together and add up the score. The player with the largest score after 10 rounds wins. 10. Place Value Game-- Each player gets 10 cards and sets them up in a pyramid without looking at them; 1 on the top row, 2 on the second row, etc. Players then flip over their top row and the one with the largest number gets 1 point. Players flip over their second row and the one with the largest two digit number gets 2 points, the one with the largest third row gets 3 points and the one with the largest 4th row gets 4 points. Play continues until one player reaches 25. Ok, I will go check it out. Thank you, these are fantastic! I need to do more games with my 8 year old. Sharing!